Armed groups in the Central African Republic (CAR) have been told to leave the schools they are occupying or face forceful eviction by UN troops. The UN says 10,000 children have been unable to resume their education this year because militiamen have set up base in their schools. 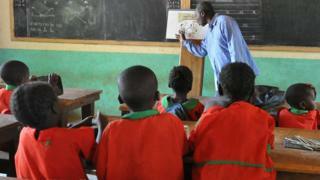 A third of all schools have either been struck by bullets, set on fire, looted or occupied by armed groups, it says. The CAR is trying to recover from a brutal civil war that erupted in 2013. More than 12,000 peacekeepers are based in the country where sporadic violence continues. The UN mission in the country, known as Minusca, said all armed groups should not come within 500m (1,650ft) of schools and warned them not to hinder educational activities. Children across the country returned to class last week, but insecurity in some areas outside the capital, Bangui, has disrupted the start of the school year, the UN children's agency said. Displacement and a lack of teachers were also contributing to the problem. "Schools are not part of the conflict, they have no political affiliation," Unicef's Donaig Le Du told the Reuters news agency. The conflict has been fought along religious and ethnic lines, killing thousands of people and forcing hundreds of thousands of others from their homes. A group of mostly Muslim rebels in the Seleka movement briefly took control of the country in 2013, sparking reprisal attacks from a mainly Christian militia, called the anti-Balaka. Faustin Touadera won elections in February in a contest that was seen as an important step towards restoring peace.